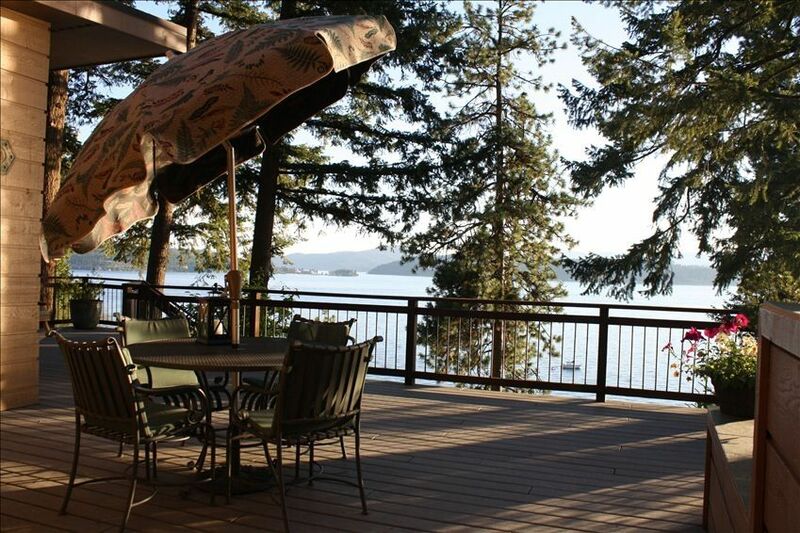 This home has two large decks with an unimpeded view of Lake Coeur d' Alene. It is located on a bluff overlooking the lake, below which is a frontage road between the bluff and the lake. This allows access to our private dock. You can rent or bring your own boat... This house is a five minute drive from central downtown Coeur d' Alene. Lake Coeur d' Alene is 27 miles long and has l09 miles of shoreline. We are located on the North end of the lake. Leather furniture, down blankets for all, lovely patio furniture and all cooking necessities right down to the cookie sheets tastefully makes this home a place for relaxation. It has a 'nature' theme which instantly relaxes you when you walk in. There is a queen sized bed in one bedroom and a double in the other. Two twin sized, fold- out mattresses are also available. The house is spotlessly clean and very comfortable. It is beautifully landscaped with a very relaxing lawn overlooking the lake which has a different feeling than the deck view. The lawn is large enough for croquet (furnished) or simply relaxing. From the deck you can see The Lake Coeur d' Alene Resort Golf Course with it's 'famous floating golf green'. There are l9 public golf courses near by. The 'Centennial Trail' a 26 mile, paved hiking or biking trail, is adjacent to this property as it traverses along the lake heading toward Spokane, Washington. There is also a newly completed Rails to Trails 83 miles circuit through the Coeur d'Alene Mountains within 30 minutes from this home. The Hiawatha Trail is another popular Rails to Trails path designed for mountain bikers. This trail is famous for its numerous trestles and tunnels. You can reach this fun activity within one hour. Some of the community activities include Bald Eagle watching during the months of December and January. (We furnished the binoculars!!) This year over 200 eagles were spotted and one of the prime viewing areas is only 5 minutes drive from the house. Some of the eagles frequent our pine trees right off our deck each winter! Other area activities include the Bloomsday Race in Spokane in May, Ironman Race in June, Antique Wooden Boat show in July, outstanding Fourth of July Fire Works over the lake, several car shows, Art on the Green Festival the lst weekend in Aug, Coeur d' Alene Marathon, Indian Pow Wow in July, Summer Theater, several Music Festivals nearby, and many other unscheduled activities. In the fall months of September and October, it is beautiful here as there are many deciduous trees changing color. The entire mountainside is painted with swaths of yellow tamarack (larch) trees, and the weather can't be better! Four major ski resorts are located within 50 miles of Coeur d'Alene, there are many miles of snowmobile trails as well as designated cross country ski trails close by. The end of December brings the bald eagles annually and our famous New Year's Day plunge into Lake Coeur d Alene. Views of Coeur d'Alene Resort Golf Course and floating green. Wonderful view of Lake Coeur d'Alene. This property is on a bluff overlooking the lake with a road between the lake and the house. This property has a private dock for your enjoyment. There is a upper deck and a lower deck also, each has lawn furniture. We furnish life jackets in various sizes. The Coeur D' Alene Resort Golf Course is 1/2 mile away, you can see the "Floating Green" from our deck. This house is located on a cliff, we do not accept children under the age of 5 years old. Hair dryer, Binoculars, Blender, WiFi, No Smoking or Pets allowed Not appropriate for children under 5 years old. House is located on a large cliff. Second stay as wonderful as the first! This is my husband's and my second time to vacation in Coeur d'Alene and our second time to rent this home. I wouldn't stay anywhere else. This house just feels like home. Our adult children rented another home down the street, but all the gatherings were here. We tried to be back everyday from our activities to sit on the deck with wine and hummus and watch the most incredible sunsets over the lake. We also enjoyed the deck every morning, having hot tea and breakfast and watching all the birds come feed at the feeders. This home is in close proximity to downtown, but far enough from the crowds. The home is also conveniently located to the running/walking/biking trail along the lake. We also enjoyed the dock -- swimming and hanging out on the water. We will be back again! We stayed for 8 days in July and were fortunate to have near perfect weather. The house is very comfortable without being large for large sake. Both bedrooms had ample space but be aware there's only one shower in master bath. For 2 couples no big deal, more than that might create a logjam. The dock is at the bottom of the hill and realistically requires a car to load up your boat for the day. Parking is very limited on the road. The real appeal to the property is the deck. It almost feels larger than the house itself. The views are wonderful and the only real noise is the occasional boat that's running near shore. The location is very convenient sitting less than 5 minutes from the CDA resort golf course. If you're a golfer I highly suggest you drive the 1/2 hour to play Circling Raven in Worley. It's ten times the course. The drive downtown is only 5 plus minutes away and parking wasn't really an issue. Lots of live music to listen to either from a street front table or inside. All in all a fun town. Boat and jet ski rentals were easy to obtain. If you're wondering should you stay at the resort or rent a house trust me, RENT THE HOUSE. It's less expensive, better room, better view and way more comfortable. My wife and I stayed in this house for 6 nights to compete in the Ironman Coeur D’Alene. This was a perfect place for us. We had high hopes from the pictures and the description on the web page, but as soon as we set foot on the property, it exceeded our expectations. Only 5 minute drive to downtown, it felt completely private and ‘away’. It was a peaceful and relaxing place to help us get ready. For IM spectators, the location is ideal. It is (almost) on the race course where the bike/run pass by 8 times. And for the rest of the trip, we loved the decks with the gorgeous views over the lake and the private dock where we could take a swim and hang out. We cooked a lot and the kitchen had everything we needed - every pot, pan and basic condiment we needed and even a blender that really works. Every thing about the place just felt well thought out. On top of that, the owners are super nice and helpful. We highly recommend this place. Girls trip extraordinaire! We loved every minute of our stay and definitely plan to stay again. So clean, cute & close to the water and town. Owners were very accommodating. Serenity & beauty inside and out! "Pristine" is a very good word for this lovely property! My husband and I joined my elderly parents from Texas to stay the first week of August to enjoy our reunion as well as plan my mom's end of life decisions, and yes, to also have some fun! Darilyn and Paul were super to work with on arrangements, and answered my many questions very affably. The pictures above represent the place well. First morning, we ate out on the lovely spacious deck while breathing in the beauty and tranquility of Lake Coeur d'Alene. and watching the various birds busy at the feeders Lovely! I was hooked! The weather was perfect and we enjoyed the deck at various times of the day and night---amazing view! So beautiful and peaceful! The beds and bedding were extremely nice and comfy, we always slept well. Inside and out, all was very clean, tastefully done, and well supplied, and invited sweet companionship. We made rich family memories during our stay at the home as well as a few places about the area---like nearby Roger's for ice cream and burgers, the Olympia Greek restaurant (very authentic), plus downtown strolling, shops, and inside and outside restaurants. Also there is info in the home of local happenings---so, we went to a free concert right downtown in a park -lovely African music the night we went. All of us would definitely recommend this lovely home and would come again. The only thing we would have liked better would have been two full baths instead of 1 1/2 bath, but we managed quite well in spite of that. I cannot imagine ANYONE being disappointed in this idyllic place! We enjoyed staying in this comfortable home very much. We were three friends enjoying a ladies vacation and had a spectacular time. The home is quite lovely and furnished very well. The beds were comfortable and we just felt so much at home. The best part is the view--we could have sat on the deck all day and just soaked it in. We also hiked on Tubbs' Hill, walked on the path by the lake, took the lake boat cruise, and had a great dinner at Cedars--a floating restaurant. This has been one of our favorite trips--would come back in a heart beat, and we would stay right in this wonderful home. LOVED IT! Annual winter bald eagle watching, Dec.
Our rate for the week of IRONMAN RACE is $400.00 per night and we require a stay of 4 night minimum in June and 6 nights minimum in August.